EXETER— The day after Franklin Ross passed away a year ago, his family gathered at his Exeter house. Kelly Rider, two of her siblings and their mother, Sue Ross, sat around the family’s dining room table. Fatigued from the long hours at the hospital the day before the four of them continued to lay out plans for his service. Toward the end of the planning one of them proposed an idea to continue their father’s giving legacy. In the following months the thought turned into the Franklin Dow Ross Memorial Scholarship Foundation, and late last month they awarded their first three scholarships. 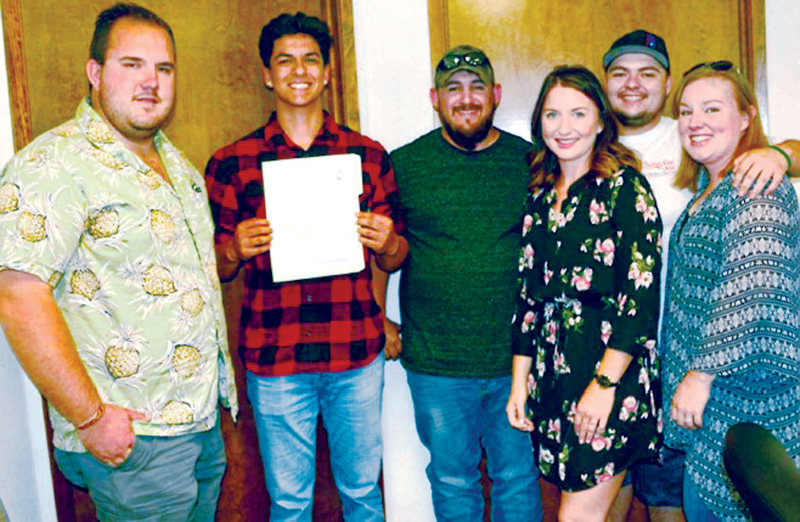 Marcus Meza (Exeter Union High School), Dominique Franco (Woodlake High School), and Brooke Rouch (Visalia Technical Early College High School) each received $1,500 toward college. The scholarship had its fair share of setbacks as well in the form of the Internal Revenue Service (IRS) losing the foundation’s application. The setback nearly postponed the scholarships a full year. Help eventually came in the form of the Exeter Kiwanis Club. A member and a friend of Kelly, Sandy Blankenship, offered to front the money for the scholarships. All the money was then transferred over to the organization and they wrote out the three checks. The foundation board decided to focus on students attending community colleges or vocational schools, where students were less likely to find scholarships. They also looked for students who might have struggled to graduate, much like Franklin. “Dad always had a soft spot for people who were on hard times,” Kelly said. The board is made up of Franklin’s adult grandchildren who wanted the money to go to local high school graduates. They offered the scholarships to students at Exeter, Woodlake, Farmersville, Strathmore, and VTEC high schools. The foundation originally intended to award five scholarships between $500 and $1,000. Instead they decided to select three students at the $1,500 mark. “We wanted this to be a legacy and this gives the grandkids a reason to get together and learn to reach out and do good for others,” Kelly said. Applications for the 2018-2019 scholarships will be available beginning in April 2019. They can be picked up from the counselor’s office at Exeter Union, Woodlake, Lindsay, Farmersville, and VTEC High Schools.